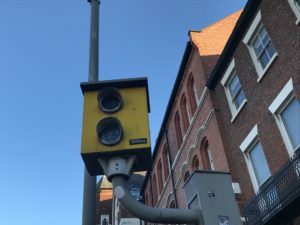 A new type of camera has been introduced onto roads in Merseyside to catch speeding motorists and help with the overall control of traffic. The temporary scheme is part of Merseyside Police’s strategy to decrease the number of accidents and injuries as part of speed awareness month. Merseyside Road Safety Partnership has introduced the ‘speed on green’ system which will detect the speed of vehicles travelling above the speed limit through the junction, regardless of the colour of the traffic signal. It will also record when a car has gone through a red light. A staggering number of 557 people were killed or seriously injured on the roads of Merseyside in 2017. There were many more that involved collisions affecting or changing that person’s way of living. Because of this, a number of junctions have been designated for the ‘speed on green’ cameras, with Sefton being the first area to trial them. Jayne Eaton from the Safer Roads Unit at the partnership told JMU Journalism: “A green traffic light signal can often create an unpredictable situation for a driver to deal with and it is vitally important that drivers drive at an appropriate speed, one which enables them to stop safely should the traffic lights change or a pedestrian step into the road. Each will be clearly signposted as a speed camera for the locations across Wirral and Liverpool.